In spite of its formidable reputation in the sporting world, Wimbledon is a laidback affair for spectators. Unlike the players, guests don’t have to observe an official dress code. You’ll encounter a mixed bunch in the crowd, from casual fans in shorts and baseball caps, to fashionistas in structured summer tea dresses. If you have Centre Court or Court No.1 tickets, you may be rubbing shoulders with well-heeled tennis fans in designer outfits, so it’s worth making an effort. If you have a grounds pass (giving you access to unreserved seating on the outside courts and the legendary Murray Mound) there’s less pressure to pull-off a courtside fashion coup – but if you ace a smart-casual style, you won’t feel overdressed. Athleisure might not be your usual choice for a day out sipping Pimms, but a tennis-themed twist won’t go amiss with the Wimbledon set. 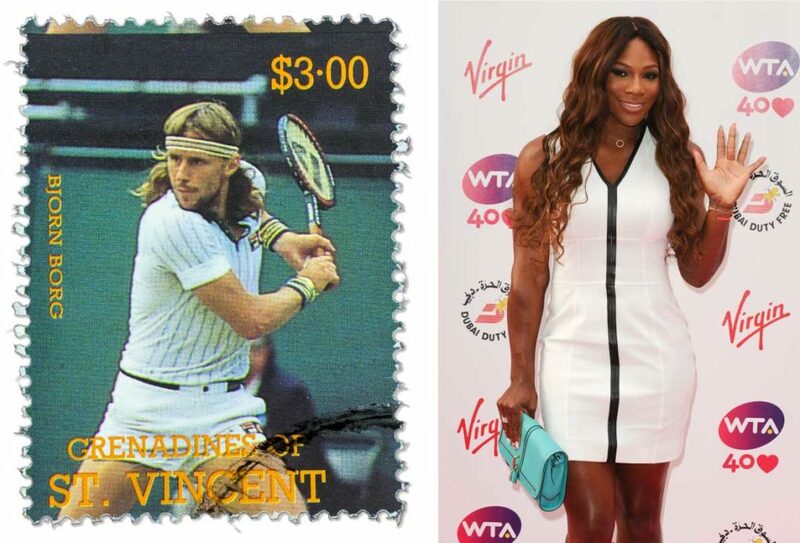 Take inspiration from the on-court fashion of players past and present; you could sport a 1920s-style midi skirt, worn with a crisp polo shirt and a chic little visor; consider channelling the ‘70s with a skort, branded sports tee and a cheeky necktie; or keep it contemporary with a Serena Williams inspired sculpted dress or playsuit. Boys: look no further than tennis style icon, Bjorn Borg, the only man in history to wear a track top and headband without a hint of irony. Clashing prints guarantee a style statement, so swap your summer dress for a silk print top with contrasting culottes. Bright, blocked colours (particularly neon) add an element of risk, particularly worn with a classic Wimbledon accessory, like a Panama hat. To mash-up classic British fashion with edgy street style, pair a floral dress (just above knee length works best) with white trainers: go for a rounded, basketball shape, as tennis shoes don’t really work in this context. If you’re suited, don’t be booted: ditch the tie and slip on a pair of low-top trainers for a smart-but-sporty look. Fashion-forward celebs, including David Beckham, Gemma Arterton and Poppy Delevingne, favour a blazer with their Wimbledon attire. A blazer with a bold print, or an unusual colour palette, stands you out from the crowd. If you’re wearing a pretty dress, a blazer adds a splash of summer-in-the-city chic; if you’re pairing your blazer with jeans, glam it up a notch with wedges and super-sized sunnies. 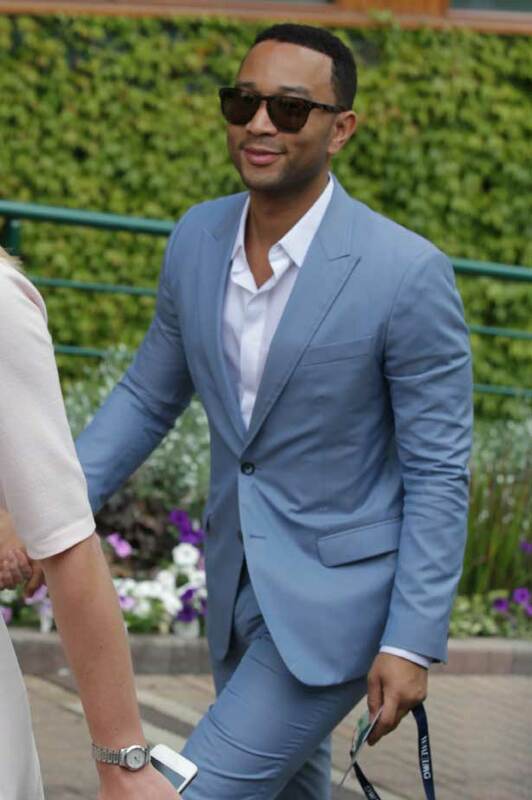 A blazer with smart trousers and a linen shirt is effortlessly cool for men and, if you’re going all-out with a suit, steal John Legend’s Wimbledon style by wearing a sky blue jacket and trousers with a crisp shirt (open at the collar) and white brogues. Unless you’re a VIP – or pulling-off a cab-to-court visit – there’s a fair bit of walking involved. It’s a hike to the tube and train stations, and you may have to queue for the courtesy shuttle bus. At the venue, you’ll be touring the courts, negotiating your way through the stands and possibly scaling the heights of Murray Mound…you don’t need hawk-eye to tell you that skyscraper heels are out. A classic wedge is your friend, or you could opt for cool sliders, flatform sandals or a strappy style with a block heel. Boat shoes in tan or navy, light-coloured loafers or all-white trainers are great choices for guys. Wimbledon is full of hotspots, particularly on the outer courts where the action is exhilarating and the afternoon sunshine is merciless. There’s nothing fashionable about a bright pink face and comedy tan-lines, so make sure you’ve packed the SPF50 and a sunhat. Pop a cami top, light linen slip dress or t-shirt into your tote bag to change into if the temperature skyrockets or, if rain is forecast, pack a cute poncho that compliments your outfit and will keep you dry. If you’re a fan of the classics, all-white is the dress code for players, and a crisp, ice-white dress or suit will make you look and feel as outrageously expensive as Wimbledon’s £34 million prize money pot. Celebs including Rosamund Pike, Sienna Miller, Kim Sears, and Meghan, the Duchess of Sussex, have dazzled in white ensembles at championships past, and Jude Law cut a dash in a white suit during the 2016 finals. Adding a pop of colour? There’s really only one option: strawberries and cream. If you’re worried about keeping the outfit pristine for your next social engagement, Laundrapp is your partner in grime, whisking off your whites – and the rest of your post-Wimbledon washing – and delivering them back to your door, fresh, pressed and ready to win again.